Several pieces of permeability information were gathered. Measurements from core data show intrinsic permeability for the Lyons between 0.1 and 3,000 md (Belitz and Bredehoeft, 1988). 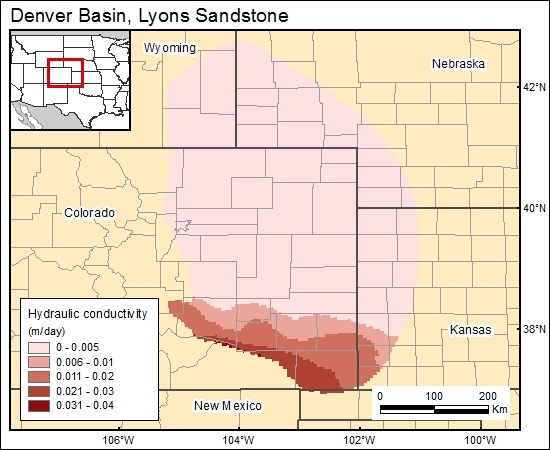 According to oil-field data in the subsurface, Lyons average permeability ranges from 0.9 to 88 md/ft (Levandowski and others, 1973). A transmissivity-simulated map (Belitz and Bredehoeft, 1988) was added to the GIS data base. Levandowski, D., Kaley, M., and Smalley, R., 1973, Cementation in the Lyons Sandstone and its role in oil accumulation, Denver Basin, Colorado: American Association of Petroleum Geologists Bulletin, v. 57, no. 11, p. 2217-2244.